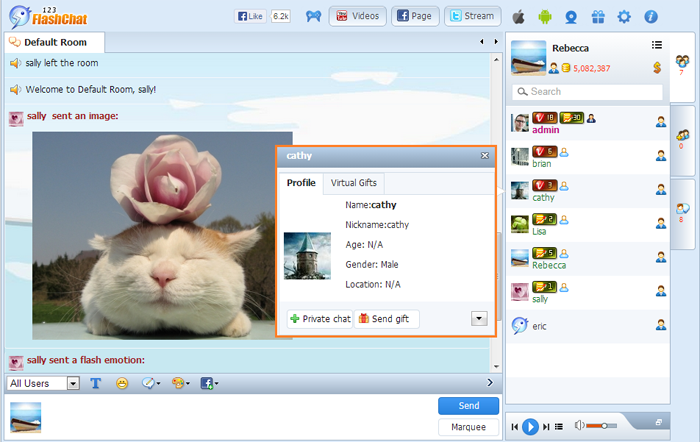 User profiles can help the chat users to learn more about each other, name, email, location, age and gender. One can launch the other user's profile panel by clicking the icon in front of his/her user name, or launch one's own profile panel by clicking the icon in front of one's own name. The personal chat functions have been integrated to the profile panel. Choose a user to launch the panel, there you may easily private chat, send files, add him/her to friend list, send personal message, whisper him/her, or block him/her as well as checking his/her profile.